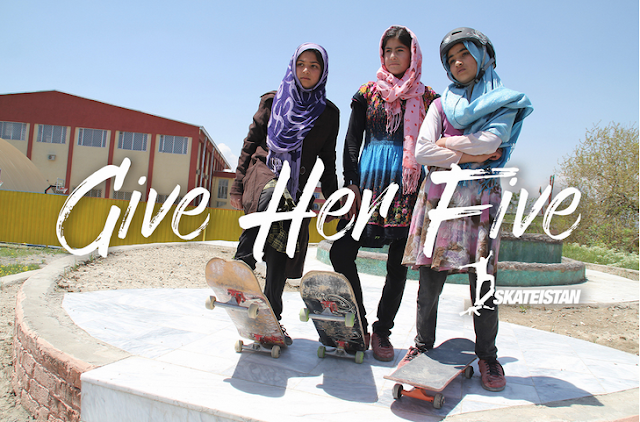 Girl is NOT a 4 Letter Word: Skateistan's "Give her Five" Campaign. Skateistan's "Give her Five" Campaign. We love Skateistan and all it does for girls skateboarding in Afghanistan, Cambodia, and South Africa, so we are happy to share this campaign with all of you. For only $5.00 - which is about the price of your morning Starbucks coffee - you can join their "Give Her Five" Campaign to help Skateistan raise $100,000 to continue the work they do for these girls. Skateistan believes girls have an equal right to be safe, play sport, go to school, have confidence and become leaders. 50% of their students are girls. At their Skate Schools in Afghanistan, Cambodia and South Africa, girls are skateboarding and learning together in much-needed safe spaces. From December 5th - December 31 Skateistan is asking the public to "Give Her Five" by donating $5 in a bid to raise $100,000 by December 31. So donate $5.00 and put a card in your fav skater girls stocking, or gift this holiday, letting them know you donated in their name. Teach the gift of giving and help keep Skateistan running so girls can enjoy learning and skateboarding, in a safe environment..